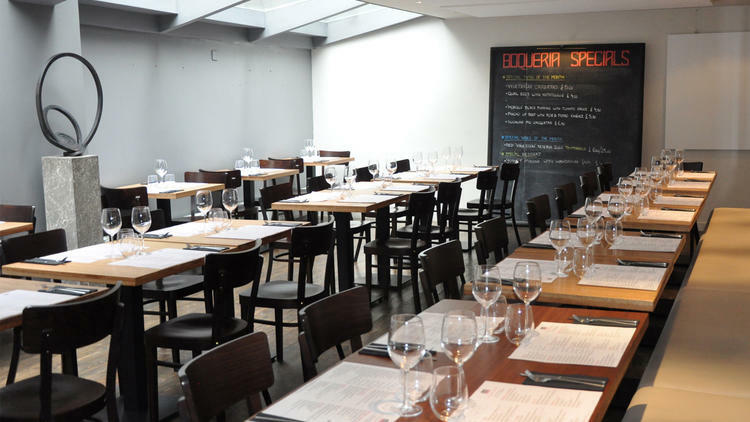 “Setting itself apart from your average tapas joint, Boqueria offers a fresh, modern menu that merits repeat visits. The vibe is laid-back, and the L-shaped space has been thoroughly optimised, with aluminium stools along a stylishly spot-lit (and well-stocked) bar leading through into the main restaurant; downstairs is an upbeat bar area with more tables (available for private hire). References to the mother country are plentiful: flamenco on the sound system, photos of Spanish market scenes on the walls (Boqueria is named after Europe’s biggest food market in Barcelona), knowledgeable Spanish waiting staff and real-deal Iberian ingredients. A simple plate of tomatoes, garlic, parsley and olive oil – a dish that seems only to work in Spain – was packed with flavour; lightly battered calamares were cooked to perfection; suckling pig – crisp on top, meltingly tender underneath and served with a lemon sorbet – completely lived up to its high-end appearance.